Zeronomikuma arrived in Berlin! He flew all the way from Japan to join us in Kazaguruma Demo. 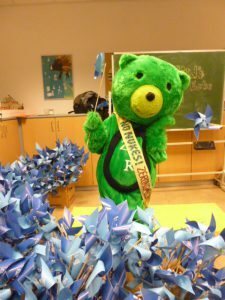 Despite his long flight and jet-lag, he joined our pinwheel-making&dance workshop last Saturday. We had fun making all the pinwhees which will be distributed at our Demo, we made over 600 pinwheels so far! We thank all of those who participated in the workshop. We are very much looking forward to meeting with you at Kazaguruma Demo on March 7th. Let us raise No Nukes pinwheels to the sky together!